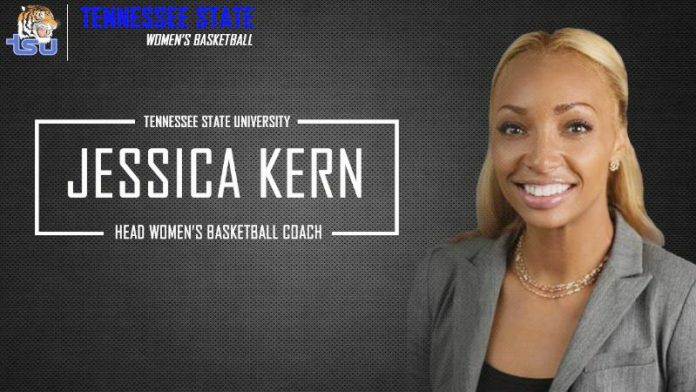 The Tennessee State University Lady Tigers have a new head basketball coach. TSU Athletic Director Teresa Phillips announced Wednesday that Jessica Kern had been hired as the 11th head coach in the program’s history. She was most recently head women’s coach at Mississippi Valley State University. She helped elevate them into the Top 25 among most improved Division 1 women’s basketball programs. Kern also established the Kern’s Korner Community Outreach/Mentorship Program, and also helped assemble the largest recruiting class in school history. She spoke with enthusiasm about her new position. Prior to taking over the program at MVSU, Kern was an assistant coach at Furman University following a four-year stretch as head coach at NCAA Division II Lincoln (Pa.) University. Kern has previously been named Central Intercollegiate Athletic Association (CIAA) Coach of the Year. That came in 2014-15, when her team went 22-9 and finished in a tie for the CIAA Northern Division title. She guided the team from a three-win season in her first year (2011) to that 22-9 mark in her final year there. Her Lincoln squad also earned the program’s first win over a Division 1 opponent, beating Morgan State 94-86. She’s also been an assistant coach and media specialist at the University of Wisconsin-Milwaukee, and an assistant coach/recruiting coordinator at Arkansas-Pine Bluff. Kern also was a three-time All-Big Ten selection at Penn State University, and a captain on the track and field team. She played professionally for seven years in Europe. During those off-seasons, Kern taught at various Milwaukee high schools and assisted various girls basketball and track & field teams, while also establishing basketball camps in inner city neighborhoods. As a high school athlete, Kern earned 11 letters in basketball, volleyball, and track and field at Washington High School. A Milwaukee native, she graduated with a bachelor’s degree in journalism from Penn State in 2002, and has one son, Bobby Lee Collins, Jr.